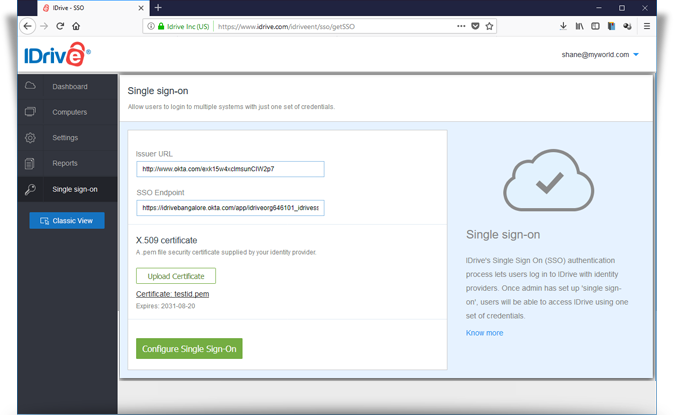 How do I set up single sign-on (SSO) with IDrive? How do I configure my IDrive account for SSO? How can I enable SSO for my sub-account users? Can I configure my own identity provider for SSO? If I disable SSO, can my sub-account users still access IDrive? How do I link my computers and mobile devices? 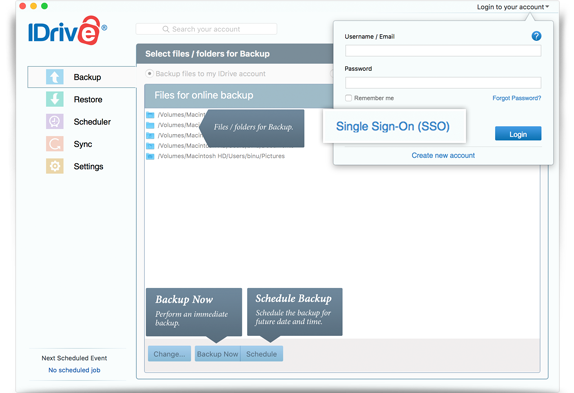 How do I login to my SSO enabled account from the IDrive desktop application? Single Sign-on (SSO) is a one-step user authentication process. If you are the admin of an Enterprise account, you can allow your sub accounts to access IDrive by signing in to a central identity provider. 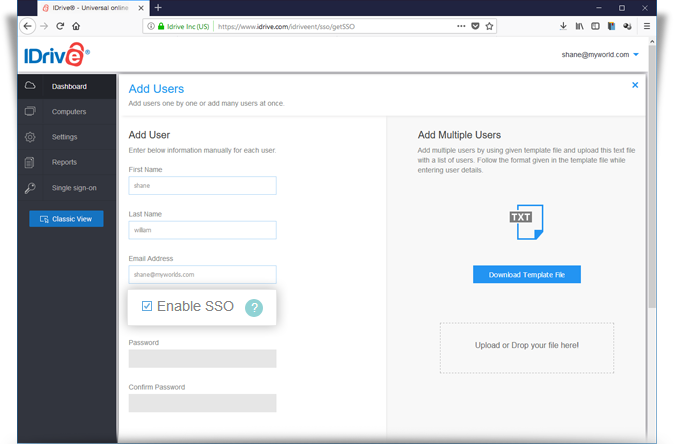 With single sign-on (SSO), you can put the identity provider you already trust in charge of authentication, and your sub accounts can access IDrive without another password to manage. If you have subscribed to the IDrive Enterprise plan as an admin, you can enable your sub-accounts to access IDrive by signing in to a central identity provider. To set up SSO with IDrive, you need to first configure your identity provider and then configure SSO in IDrive. Go the 'Dashboard' tab, and click the 'Single Sign-On' tab on LHS. You can enable SSO while creating sub-accounts. Just ensure that the user credentials associated with the identity provider are mapped with your sub-account usernames in IDrive. From the 'Sub-accounts' tab, click . The 'Create Sub-account' screen appears. Enter 'First Name', 'Last Name', and 'Email Address' of your sub-account. Select the 'Single Sign-On' checkbox. Allocate storage space and click 'Create Sub-Account'. On the 'Dashboard' tab, click . Select 'Add Users' from the list. The 'Add Users' screen appears. Enter 'First Name', 'Last Name', and 'Email Address'. Select the 'Enable SSO' checkbox. Note: SSO enabled sub-account users cannot update the email address, reset or cancel their account. In case an admin disables single sign-on for a user, the admin will need to set a new password for that sub-account user. Once done, the sub-account user must log in to the IDrive account with their username and new password, on all the relevant devices to continue with the backups. All computers and mobile devices that are currently linked to IDrive accounts will continue to work as normal. However, if users need to relink a device or link a new one, they'll need the latest versions* of the desktop application and mobile app in order for single sign-on to work. If they haven't signed in to your identity provider, they'll be automatically redirected to do. * Note: SSO is supported for IDrive Windows application version 6.7.1.17 and higher / Mac application version 3.5.2.5 and higher / iOS app version 4.1.4 and higher / Android app version 4.1.15 and higher. 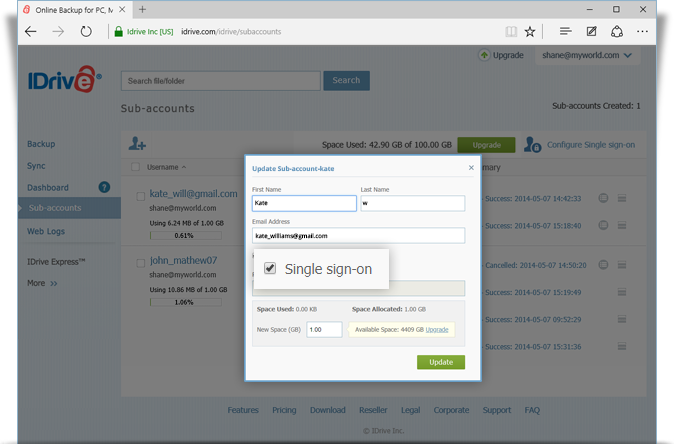 Once the admin enables SSO for a sub-account user, they can use the IDrive desktop application to login. 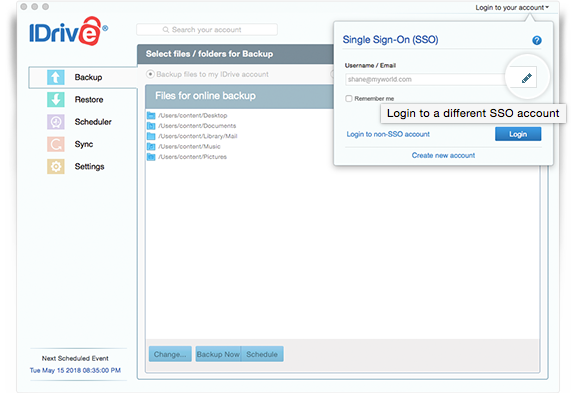 On the 'Login' screen, click 'Single Sign-On (SSO)'. Enter 'Username / Email' and click 'Login'. You will be redirected to IdP web login page. Enter the username and password registered with IdP, when prompted to enter credentials. 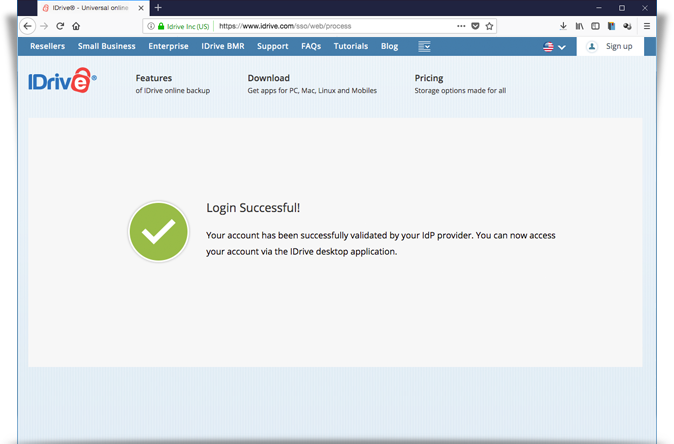 Upon successful validation of user identity, you will be prompted to go back to the desktop application and you can now continue using your IDrive account. Logout from your SSO account. Click against 'Username' on the SSO login screen. Click 'Yes' in the confirmation popup to switch to another SSO account.